Report by Fr. Julio Gonzalez, S.F. at Holy Cross Parish? If "yes", please give details. 2.5. How do you see the Monthly Home Visit at Holy Cross within the next three years? The same, increasing, decreasing. Please explain. at Holy Family Parish? If "yes", please, give details. within the next three years? The same, increasing, decreasing. Please explain. 6.1. Is the MHV/HFA still a useful tool to evangelize families? 6.2. How can the MHV/HFA help families to grow in their faith and develop a spirituality? The Church proposes the Holy Family of Nazareth as a model for all families. In the family of Nazareth we encounter the example of a man and father (Joseph), the example of a woman and mother (Mary) and the example of a son and person (Jesus). There are different ways of fulfilling ones role in communion with others without excluding anyone; however, the harmony of the House of Nazareth does not depend on the roles of each member, but rather on the unconditional love which unites them. This love is not only human in its expression but also divine in its mystery and universality. The life and testimony of the Holy Family is proposed for everyone without exception. Because of this, the Holy Family is not just a model for some families, but for the whole Church (a family of families). Traditionally, the Holy Family has been proposed as the perfect model for religious communities. Thus, Jesus, Mary and Joseph accept God’s plan and they carry out this plan through perfect obedience, perfect chastity and perfect poverty. 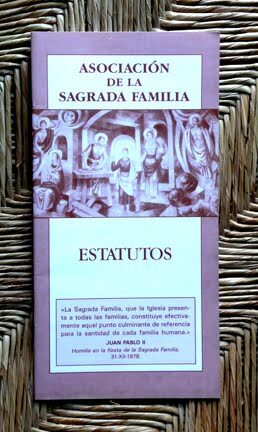 However, the Holy Family cannot be reduced to being the perfect model only for consecrated life. God makes himself present in the home of Jesus, Mary and Joseph so that all families can feel and know the nearness of God. Hence, the Church proposes the spirituality of the Holy Family to inspire families and individuals to face their questions, fears, challenges, sadness, joys and hopes of today’s families. The first challenge of the Holy Family Association is to present the Holy Family as a model of family and human relationships to all families and to the Church. One cannot love whom one does not know and the Holy Family of Nazareth continues to be, twenty-one centuries later, a great unknown to many Christians. This is in part because of the mystery which they represent and also because we have committed the mistake of making a Holy Family of our own ideas and beliefs. Because of the temporary and finite nature of our ideas, we cannot grasp the totality and the universality of the plan of God. Next Thursday, first of the month (October 6), the entire congregation is called to unite in prayer before the Blessed Sacrament to pray together for vocations to priestly and consecrated life. "We live in a time characterized by relativism which permeates all life environments. Sometimes, this relativism becomes combative, directed against those who claim to know where to find the truth or the meaning of life. Let me address this point on the specific situation in Germany. The Church is organized optimally. But behind the structures, do we find strength of faith in a living God? We must honestly say that there is a gap between the structures and the Spirit. The real crisis of the Church in the Western world is a crisis of faith. If we do not reach a renewal of faith, any structural reform will be ineffective. Let's go back to these people who lack the experience of the goodness of God. They need places where they can talk about their inner longing. We are called to seek new ways of evangelization, ways that might be small communities where people live the gift of friendship developing a better understanding of who they are and who they are called to be. In this small communities people can talk easily about their experiences of faith in their jobs and in their families or acquaintances. Thus they are able to witness a rapprochement of the Church to society. To them it is clear that all have need of this food of love, friendship concrete with others and with God. 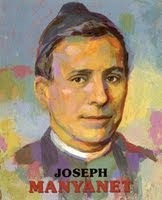 But it's still important to know the relationship of the Eucharist vital, because without Christ we can do nothing (cf. Jn15, 5). From the Pope's speech to the Committee of German Catholics, September 24, 2011. Source: Fr. Jesus Diaz Alonso, S.F.